The Act-On message wizard includes a spam scoring feature that checks your message for characteristics that make it more likely to be perceived as spam. The spam scoring engine checks your message for common characteristics of spam and assigns a score between 0 and 15. The higher the spam score, the more likely it is that your message will be blocked by receiving mail servers, ignored by your recipients, or flagged and reported as spam. A score as low as 5 represents characteristics that will cause some mail servers to store an incoming message in a 'junk' box, so the intended recipient may never see it. As you compose your message, use the spam scoring function to help you find the things in your message that raise the spam score, and try to eliminate them. 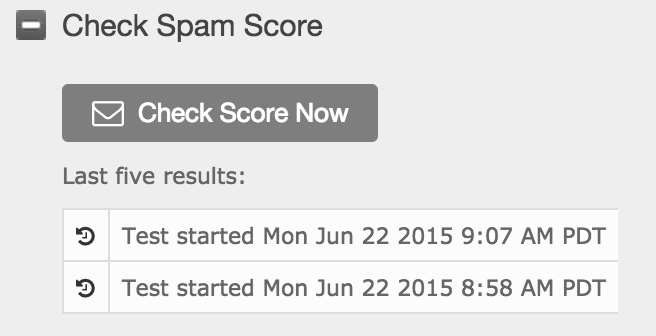 From the Review tab, click Check Spam Score > Check Score Now.